BIG DEAL This sequel's cast, story thread count and opening weekend box office figures may be larger, but the laughs have been downsized. The suits at Disney mean to have their cake and eat it, too. At any rate, their Ant-Man and Deadpool, too. The Marvelverse, being a construct in which comic-book characters enact dramas and tragedies of faux-Shakespearean graveness, can get heavy. As a counterweight to all the spandex Sturm und Drang, the company's business plan requires periodic release of a picture with a hero whose primary superpower is snark. One of countless quandaries flagged by Ant-Man and the Wasp, Peyton Reed's follow-up to his 2015 film, is the question of just how many caped comedians one franchise can accommodate. This CGI world already has Deadpool breaking the fourth wall, winking, nudging and generally taking care of meta-business. Do we really need the sitcom-level laughs intermittently provided by Ant-Man? If this sequel is any metric, the answer is an unmitigated yawn. Even by Mouse House standards, this is puerile stuff. Plus a waste of serious comic talent. Paul Rudd, one of the planet's most effortlessly funny performers, returns in the role of burglar-turned-bugperson Scott Lang. This time around, we find him under house arrest for — you know, I haven't the foggiest. I haven't seen Captain America: Civil War. Also part of Disney's business plan: linking its Marvel products thematically so you've pretty much got to buy a ticket to one to fully get what's going on in the next. Thoughtful. Being housebound proves troublesome when Scott's mentor, inventor Hank Pym (Michael Douglas), and his daughter, Hope (Evangeline Lilly), arrive looking for help with a little problem. Turns out Hank's wife, Janet (Michelle Pfeiffer), presumed dead, has spent years trapped in a subatomic dimension called the Quantum Realm. Hope has a special suit that enables her to get small (she's the Wasp). Hank has constructed a massive bleeping, flashing contraption capable of tunneling into the Realm. I never did figure out exactly why they needed their old pal. But off the three go anyway to save her, after rigging Scott's ankle monitor so it reads as though he's still home. Micro one minute, supersize the next, the trio does battle with a stunningly dull selection of baddies, seemingly plucked at random from Marvel's Warehouse of Interchangeable Villains. 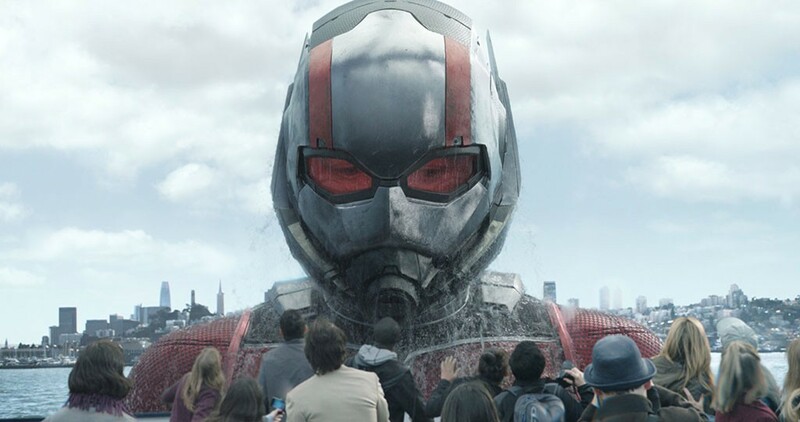 For a film with five credited writers and a running time topping two hours, the second Ant-Man outing is appallingly short on laughs or narrative flair. Just 24 hours after I watched the movie, it was — in my mind — a blur of ho-hum chases and fight scenes. We all know about computer-generated images at this point, right? It's no longer enough to see buildings turned into rolling suitcases, or actors the size of Altoids zipping through space. Something new, entertaining and inventive has to be done with an effect for it to qualify as special. The multitudinous makers of Ant-Man and the Wasp come close to meeting that standard on a shockingly small number of occasions. Reviewing the original, I wrote, "Call me crazy, but I believe there are entertainers you're meant to go to the grave having never seen in a spandex costume. Sadly, the list of actors of whom one can say that is getting shorter by the day." Different strokes, I suppose. The new installment debuted at No. 1. I'm glad the rest of the human race is having fun. Around the ninth or 10th time that building shrank into a rolling suitcase, I ducked out for a soda. What I really wanted, though, to be honest, was a can of Raid. The original print version of this article was headlined "Ant-Man and the Wasp"